A charming country style home such as this exudes warmth, a welcoming atmosphere and the use of neutral tones which makes a home such as this so special, especially for a small young family in need of the perfect starter home with all modern finishes and minimalist pieces as well as a touch of a character-filled bright colour for that personal effect. 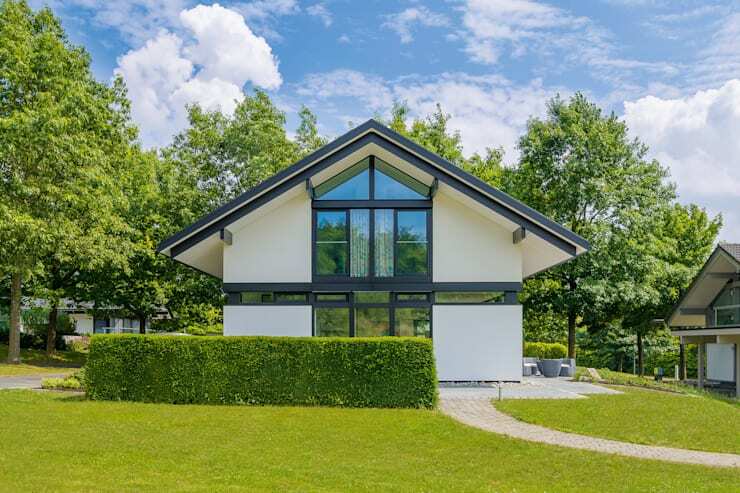 This adorable residence surrounded by nature and greenery is the perfect living space for those who are tired of the concrete jungle and the working world. The home is calling for inhabitants that want to escape the grey buildings of the city for something lighter, brighter and more cheerful… the suburbs. And although many working people prefer to live in the city closer to their work for commuting purposes, some love the idea of living in the country and taking in the fresh air! A modern monochrome home with this stunning exterior seems small for its purposes, but the ideas of the exterior and interior are linked in such a way that similar colours and tones are used both inside and out. The fascinating roof shape adds a country style charm to the home, while the large glass windows on both the upper and lower levels will ensure that the magnificence of the home is translated even in the natural flow of sunlight and free flowing ventilation. The home is surrounded by greenery, making the environment a rather important factor in the development, design and creation of this rustic looking yet modern family home. The pathway leading to the home transforms into a perimeter allowing the design of the home to stand out even more. Who would've thought that simple use of colour and design could work so well with unprecedented greenery surrounding it? 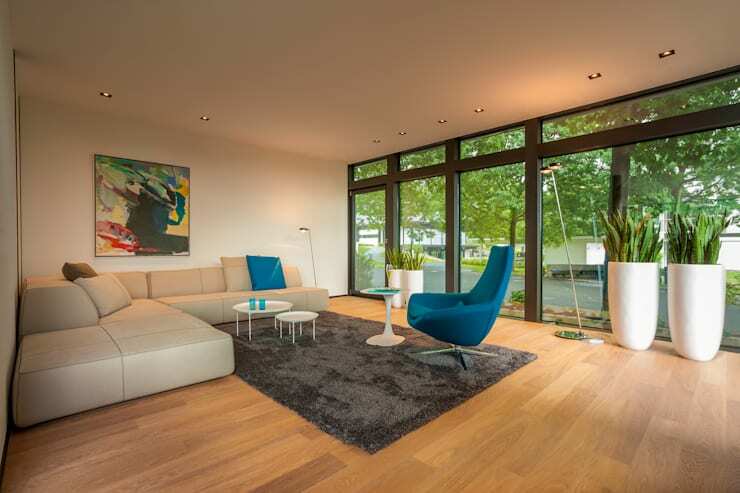 The home designed by the team at Huf Haus GMBH in Germany have done an excellent job in the architecture and design. This stunning living room is the perfect place to enjoy the peace and quiet of the suburbs. The floor to ceiling sliding doors allow for a steady and warming flow of natural sunlight throughout the day, while at the same time allowing for the wonderful green environment to be viewed from the comfortable space indoors. The use of neutral tones such as cream, grey and beige in the decor and design of this room ensures that the space will remain tastefully decorated for many years to come. While the addition of a splash of turquoise visible in the designer seat and scatter pillow, which adds a personal touch to the design of the room. The comfortable fluffy floor rug simply welcomes all guests and visitors, allowing for the space to be that much more relaxing and enjoyable! How about enjoying a nice warm cup of coffee or tea while you sit back and take in the view. The excellent designer gourmet kitchen has all the modern elements of a welcoming open plan space complete, it is one of the first things you see as you enter the home from the main entrance. The polished counter tops and neutral tones used throughout this stylish design adds to the contemporary design. With enough storage space against the wall and under the kitchen island, this seemingly small kitchen has some big ideas, while the modern appliances make for an efficient cooking space that would make cooking even an egg an enjoyable experience. How about that stunning window? 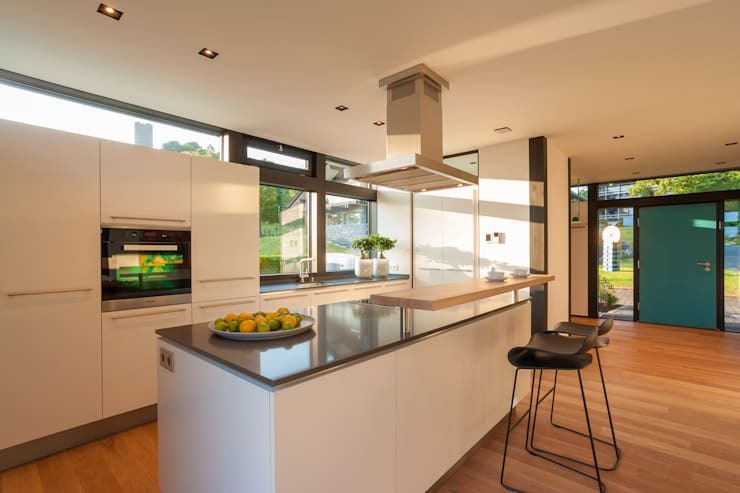 It allows for enough natural sunlight to warm the kitchen area during the day and will allow the kitchen user to catch a glimpse of the outdoors too! A kitchen such as this perfectly matches this modern home. The open plan aspect allows the cooking area to welcome guests, while being so well spaced too! In the image of this dining room, we again see the similar use of colours from the exterior… black and white. The simple hues add a modern element to this home, making it classic and understated, while also being extremely well designed… almost like a creation that has come to life! The all-white dining room table and chairs adds a minimalist touch to the home, while the large glass windows accentuate the illumination of the outdoors. Bringing a green element indoors is seen here too through the use of the beautiful plant situated in the room, while the natural wooden floors adds to the simplicity of the room. The staircase leading to the upper sleeping quarters of the home, is as understated as the rest of the décor, with each piece that was added to the home looking tasteful and full of imagination! The breathtaking master suite of this beautiful home was so elegantly designed and decorated from all angles, the room is classic and tastefully decorated in a rich cream tone along with a brown hue that makes the bedroom warm, cosy and inviting. The master bedroom is a perfect example of modern minimalist pieces with a full-on uncluttered approach being showcased so elegantly. The tasteful white furniture adds to the simplicity of the magnificent sleeping area, while the low key tones used in the bed linen supports the furniture decision. All in all each aspect of this wonderful bedroom comes together very well to create an even more elegant space. 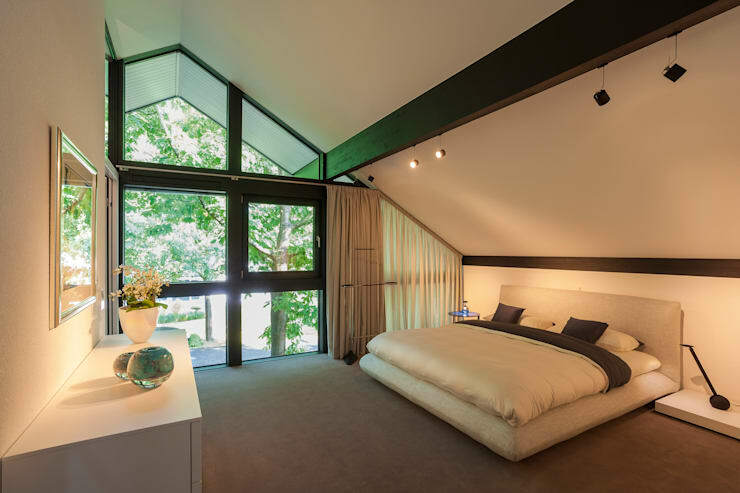 The addition of the floor to ceiling windows again allows for natural sunlight to warm the room during the day and create a calming, yet illumination bedroom experience that is welcoming and enjoyable. While in the evening you can draw the curtains to create a more private space. This fabulous monochromatic bathroom area takes the same colourful elements used throughout the home, both in the interior and exterior to make the beautiful bathing space that much more polished, classic and elegant. With a separate shower and bath tub included in the room to ensure that the individual needs of the inhabitants are completely fulfilled, sometimes all you need is a relaxing soak in the tub, while the shower offers a revitalising and rejuvenating experience for those days when you are in a hurry. Added to the beautiful and serene design experience is the soft, yet comfortable lighting which creates a relaxing atmosphere, while the addition of the turquoise pieces ensures that the synergy of the rest of the home is incorporated here too! 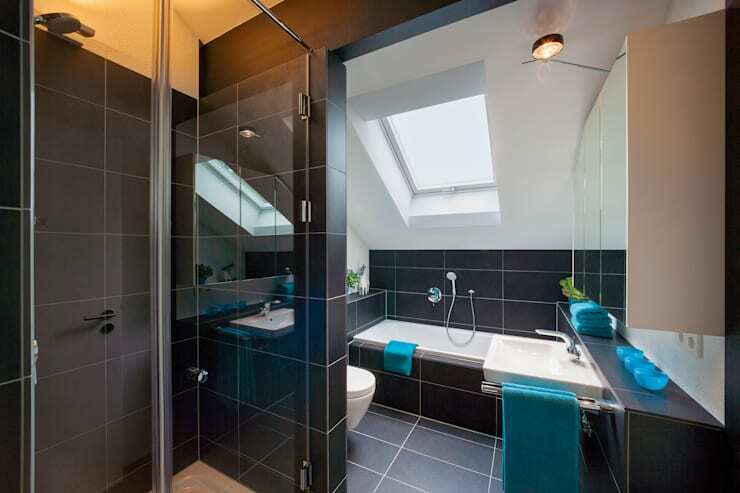 For more bathroom design ideas and inspiration, check out: Soak Up These Fancy Bathroom Ideas. Did you like the mix of modern interior design and exterior country aesthetic?